Video marketing is a game that must be played with an updated trends and following tips, tricks and strategies in a perfect way. 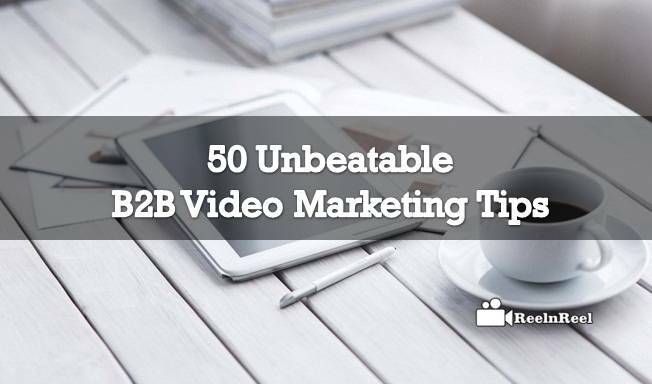 Here are some 50 unbeatable B2B video marketing tips that can help you to crack the video marketing for your B2B. 1. Always do more focus on the first ten seconds of your video. 2. Go with the video which is short and sweet as big videos might not go well comparing to short form video content. 3. If you are new B2B Company, entering into video marketing then you have to define your video objective with a detailed script and scheduling with perfect timing. 4. Make your video more engaging to the audience by incorporating the multiple options in the main footage. 5. Incorporate visual graphic elements in your videos. 6. Include strong call to actions as a call to actions is the best way to grab the customers towards you. 7. Optimize the video search related elements. 8. Create relevant title rich in keywords. 9. Create the best thumbnail that can resemble your video. 10. Go with best video description as a description can reveal the agenda of your video to your audience at one shot. 11. Make it bright. B2B videos generally shoot in a formal way with a formal style designing. So make it attractive to the audience. 12. Convey your message in a short time as it can help you to get your audience attention. 14. Garb the audience towards your video by including your video with some useful content. 15. Include keywords in your custom URL and video metadata. 16. Add transcription and annotations to increase your reach across the platform. 17. Go with some step by step guide on advanced features with an explainer video. 18. Make a product review videos for your audience. 19. Make an effective presentation on your company and its goals. 20. Shoot an event related to the product or software launching in your B2B company. 21. Launch a video invitation to your targeted audience to your event. 22. Make some best testimonial videos which can enhance your presence online. 23. Target mobile devices and optimize your video content accordingly. 24. Make a clear editorial calendar which can help you to ensure right content at right time. 25. Embed your video content on your Blog and website. 26. Include your B2B marketing videos on your website landing pages. 27. Save your webinars and publish in your blogs. 28. Drive website traffic with video content. 29. Make a video on your B2B products and services. 30. Do How to type of video content which has greater reach comparing to other video content. 32. Make a video showing the behind the curtain shots about your company. 33. Try videos with storytelling. 34. Use visual graphics and motion pictures in your explainer videos. 35. Don’t just sit at on a single platform, expand your possibilities. 36. Make an emotional marketing video which can catch the viewers’ heart. 37. Try social media paid ads and amplify the content. 38. Promote your products across the platforms. 39. Create an official company page on social media platforms. 40. Post the content consistently on social media platforms to engage the audience. 41. Take suggestions and tips regarding your video content and engage with the audience. 42. Try influencer marketing if it requires for your marketing plan. 43. Find right influencer who has a great following in your niche. Don’t go for other who has just a good following but not related to the field. 44. Try email campaigns inserting your product and company videos in emails. 45. Try product demo videos to raise the excitement in your targeted audience. 46. Create evergreen content to drive good traffic. 47. Don’t forget the video analysis to redefine your next marketing strategy. 48. Don’t create content for your company, go for the audience. 49. Don’t include the script in all your videos. Try visual marketing with graphics. 50. Try unboxing and other video marketing trends for your B2B video marketing. All these above tips can be very helpful for the video marketing for B2B marketing professionals and beginners. What is Enterprise Video Content Management System (VCMS)?